At long last, the narrative puzzle for Salvador Dali and Disney’s Destino has been put back together, thanks to the recovery of a “lost” collection of Destino art, which was presented for the first time at Chapman University on Tuesday by animation art conservationist Ron Barbagallo (view a clip here). 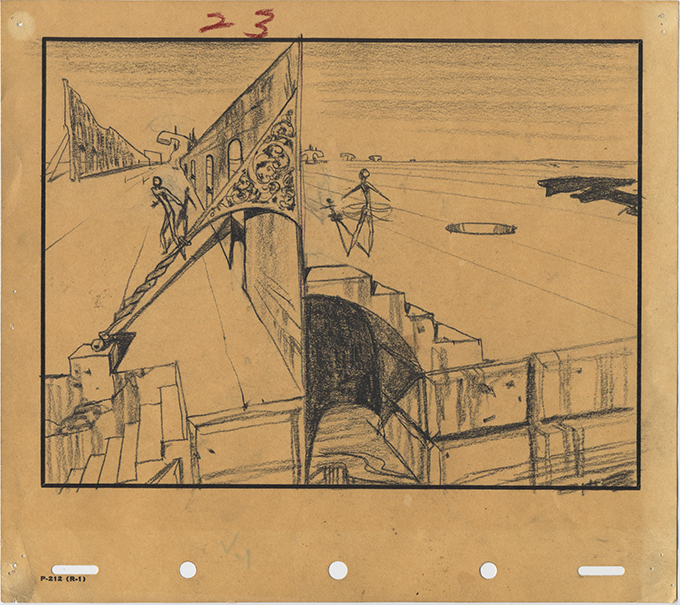 Images by permission of the Research Library at Animation Art Conservation. The Spanish painter’s penchant for abstract, surreal, symbolism has kept Destino elusive, even after the late Roy E. Disney finished the experimental short in 2003. Also, because, out of more than 200 story sketches and drawings that Dalí and artist John Hench created, only 150 or so exist in The Walt Disney Animation Research Library and the Gala-Salvador Dalí Foundation (though further visual development sketches and paintings have also been preserved by ARL). Dali painted, drew and storyboarded with Hench for several months, andDestino contained six sections revolving around encounters between a man named Chronos and a woman named Dahlia. While a series of forms (many culled from Dali’s paintings) were intended to morph into one another, Barbagallo discovered that there was a definite beginning, middle and end to each section.”The encounter shifts are very much in his own mindscape as the short starts, but it moves quickly into a more ‘realistic’ setting — a party environment,” continued Barbagallo. “The woman is seen more sexualized here and the male figure is now a series of more abstract male figures. If you look closely, you will see the spiral they’re in, you will see trappings of a party: formal attire, drinks and an exploding champagne bottle in the heart area of the Chronos male figures. This party sequence involves Dahlia presenting herself and the male figure literally becoming electrified by her presence, trying to pull her into his orbit. She recoils and runs away up the spiral where she retreats into a conch shell.The epic mindscape enlarges and we see this wilder dream-like sky full of surrealist images that include telephones, classic architectural elements, fish and pyramid shapes aping the main building to which the male figure was attached at the beginning. She presents herself again to him and he is so attracted to her, he attempts to pull himself off the architecture while she starts to dance. This is the first ballet sequence. It is significantly more conventional than the second ballet dance, and, as she continues to dance, we see her head become baseball-shaped and she is also introduced as being a dandelion blossom.